The Sonrisa Conversation Set comes in a chic and understated shade of taupe certain to garner compliments and praise. It flatters any outdoor space, looking equally at home on a patio, garden, backyard, or balcony. Whatever the season or time of day, the Sonrisa creates a circle of comfort for your visitors and family. 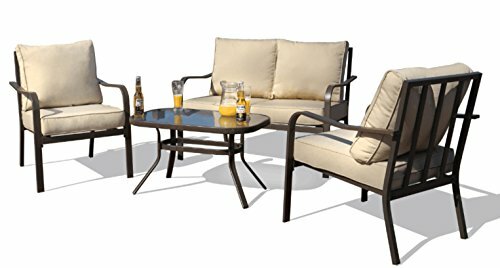 This set of outdoor furniture includes a cushioned loveseat, with firm and comfortable, sponge-filled cushions that hold their shape and make lounging a breeze. Also included are two iron, single chairs with cushions and a powder-coated coffee table perfect for holding newspapers, lattes, mimosas, and sweet treats. The wrought iron tube material is durable and elegant. If you're looking for a collection of outdoor furniture that will look chic for years to come while you eat, game or sunbathe, the Sonrisa Conversation Set is certain to exceed your expectations. Curved arms and an extra wide seat with padded cushion provide a high quality user experience. The unique back cast pattern not only makes the seating sturdier, but also creates an elegant look. A great complement to your patio or other outdoor space. Perfect for your patio, backyard, garden and balcony. Eating, gaming or sun bath, fit for your want.